Set amongst gorgeous gardens you will find this beautiful 3 bedroom townhouse, with all of the features that you have been looking for in a low priced home, in an excellent suburb of Brisbane. The townhouse is part of a complex with quiet streets and lots of greenery. The rendered townhouse has 3 good sized bedrooms, with the main bedroom having reverse cycled airconditioning and an ensuite. All 3 bedrooms have excellent builtin cupboard space. You will love the large open living area downstairs which includes both lounge and dining and opens onto a beautiful paved area with a gazebo that is surrounded by foliage. The kitchen has a dishwasher, a huge benchspace as well as a large pantry and looks out towards the courtyard at the front of the home. Your car will be secure with a single garage with remote and there is also a separate parking space at the front of the townhouse. This property was flood free in the 2011 floods. 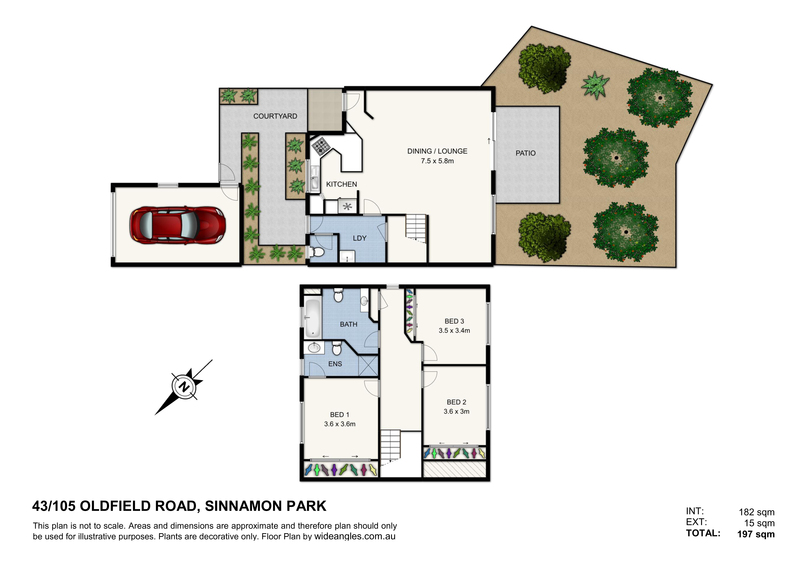 Sinnamon Park is an excellent suburb in the Centenary Suburbs of Brisbane just on the other side of the river to the city. It is surrounded by DFO Jindalee, Mt Ommaney Shopping Centre, so many cafes and restaurants, public transport and parks and schools.